One of the many things I love about the intarwebz is the plethora of amazing webcomics I encounter. Having awesome art and stories in an always-available, digital format is a good and right thing. In my travels in Tumblr Land, I stumbled upon the one-of-a-kind artwork, humor, and edgy sweetness of Charmingly Antiquated. Sam, the mastermind behind this delightful Tumblr, is the creator of a barrage of unique, often funny, just as often pointedly moving (while sometimes STILL being funny) one-shots, and of the webcomic Granted. Her work focuses most often on remarkable, diverse female characters. 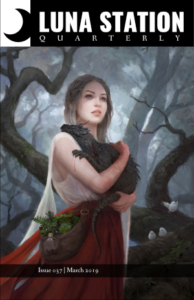 I fell in love after reading this little ditty about a dragon, a princess, and a sacrifice. When I went and read more of Sam’s work, I had no choice but to commission her to create art of Lian from my Luna Station Quarterly story “Daughter of the Sun”. Needless to say, it’s good and perfect and she knocked it out of the park. The artist’s take on diverse females (we’re talking, mermaids and banshees and cornerwitches diverse) is refreshing, her art clean, bright, and GORGEOUS. 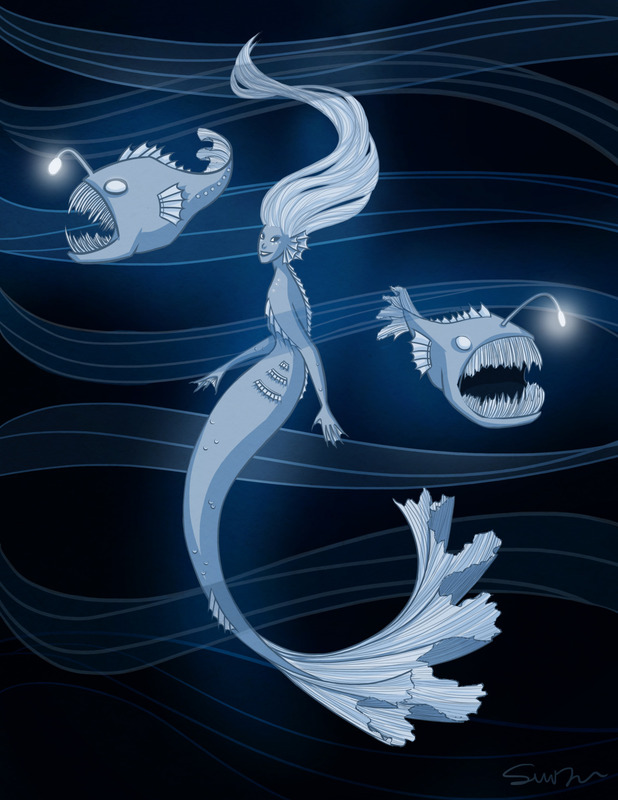 I mean, how could you not fall in love with an anglerfish mermaid? 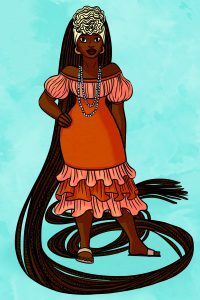 Or an Afro-Caribbean Rapunzel with 75-foot long dreads? Sam: Oh wow, thank you! There was no particular point in time that I sat down and decided this is What I Do Now; I’ve always drawn a lot, and written these kinds of stories, so webcomics seemed like a pretty natural evolution. Granted, my longer webcomic began as a way to keep in touch with my youngest sister while I was abroad, and it doubles as a way for me to practice drawing expressions, backgrounds, poses, etc. The ideas for my shorter comics usually come out of nowhere – something I think is funny, or interesting, or simply fun to draw. With regard to inspiration, I get a lot of mileage out of fairy tales and classic fantasy! I grew up with literally every color of Andrew Lang’s Fairy Books, which made a deep impression. In general, I’m very interested in the sidekicks, guards, post-adventure heroes, witches: the characters one step left of the spotlight. AE: I notice that you do all of your sharing on your Tumblr–any reason you opt for this platform in particular? Sam: Not much thought went into choosing Tumblr, because I never expected my art would become so popular. To be totally honest, I joined Tumblr in the first place because I wanted to read Homestuck theories and follow some artist. By the time I felt comfortable sharing any of my art, it was just the platform I was most familiar with. AE: Any other artists or comics out there that you yourself can’t get enough of, or other inspirations in fandom or media that keep your creative-well filled? Sam: Some favorite comics are Paranatural, Unsounded, and Lackadaisy, but I follow literally over a hundred. I love Terry Pratchett’s books, and my favorite posts on Tumblr are the ones with new takes on fairy tales and mythology: what if this was modern, what if it was told from this perspective, what if we took this story to the logical conclusion. I think that’s fantastic, and it’s something that absolutely crops up in my own work. All these tropes and archetypes and mythological creatures are so much fun, and so ridiculous from certain angles, and so easy to play with. Outside of that, I’m pretty into weird history facts, and ruins, and old maps, and pirates. I know a lot of weird history facts about pirates. Sam: Besides Granted, and future short comics as they come to me, I’m actually in the process of publishing a novel! I’ll definitely be talking about this more on my blog once things become concrete (my lovely agent and I still need to agree on a name, for one). The story itself, like my comics, plays a lot with classic fantasy tropes, sometimes humorously, sometimes not. I’m pretty excited about it!